Looking for a fast and easy way to make super-tasty Whole30-friendly short ribs? 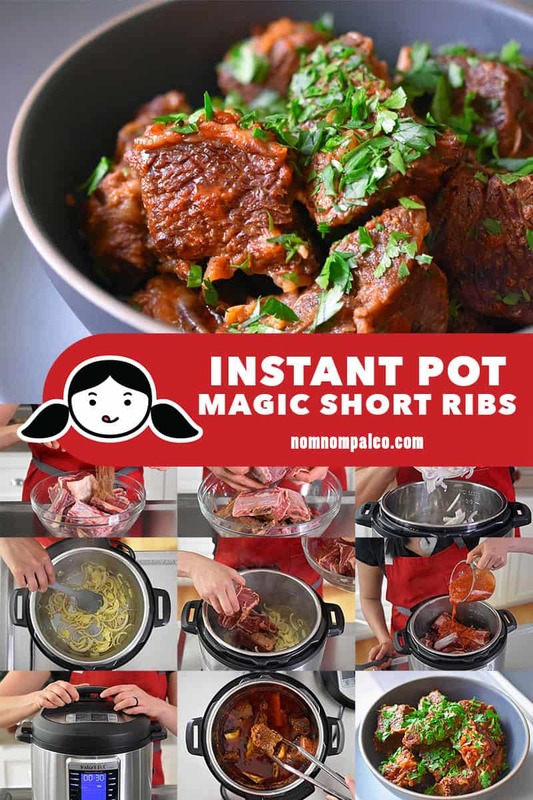 Make my Instant Pot Magic Short Ribs! 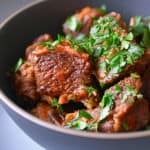 I call this dish Instant Pot Magic Short Ribs because it harnesses the power of some incredibly umami-packed ingredients (like Magic Mushroom Powder and marinara sauce). 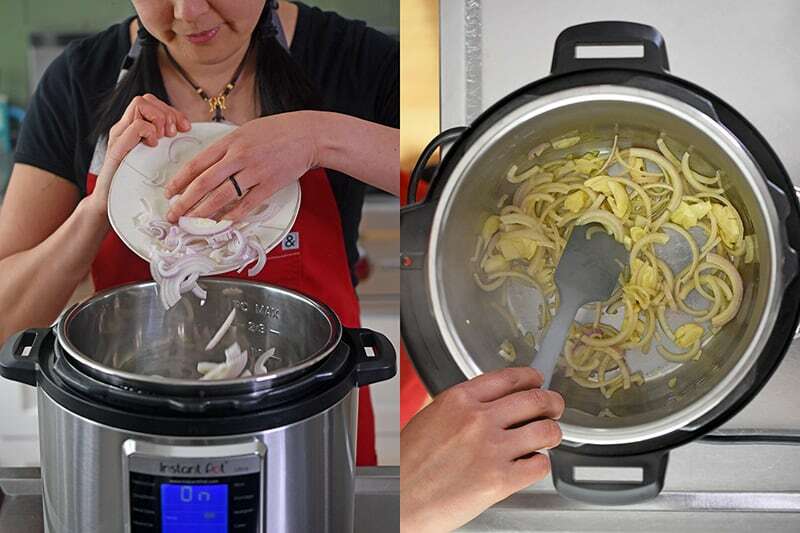 Plop them in an electric pressure cooker and PRESTO-CHANGE-O: a comforting Italian-inspired main dish can be ready in no time flat! Can I use another cut of beef? 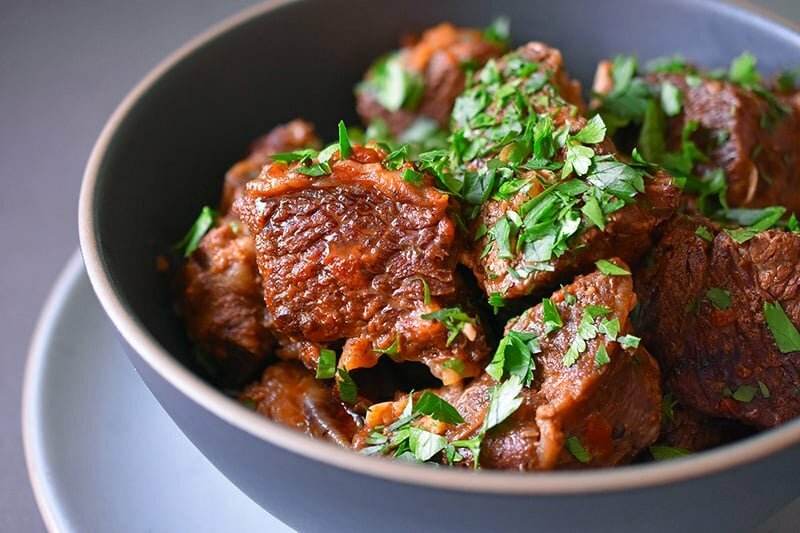 If you can’t find short ribs, you can definitely make this stew with cubed chuck roast. 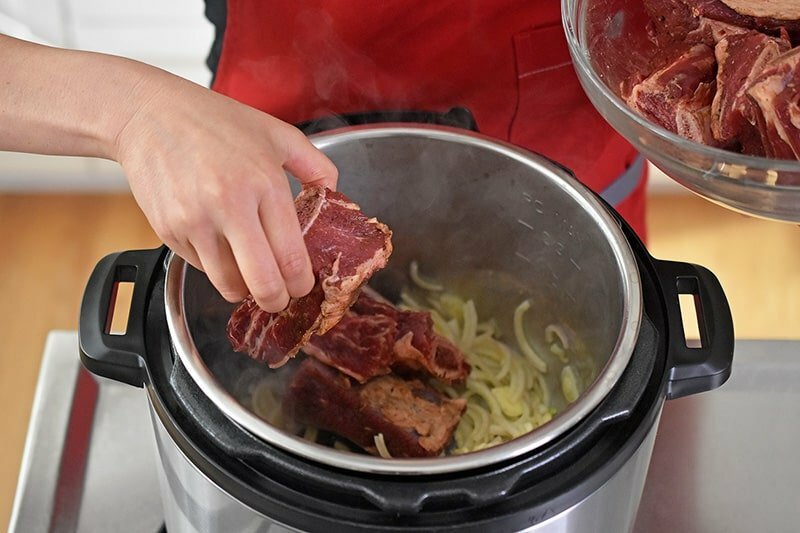 Decrease the cooking time to 35 minutes under high pressure and make sure the beef cubes are about 1½ inches across. Can I substitute chicken for the beef? Yes! I recommend using boneless and skinless chicken thighs and decreasing the cooking time to 10 minutes under high pressure. What can I substitute for Magic Mushroom Powder? My Magic Mushroom Powder (MMP) is an umami-packed seasoning salt that replaces Diamond Crystal kosher salt. If you don’t have any MMP, you can use Diamond Crystal kosher salt instead in a 1:1 ratio. Diamond Crystal kosher salt has a different structure than Morton’s kosher salt, so if you’re using Morton’s or a fine grain salt, cut the amount of salt in half. Whenever you’re unsure of the amount of salt, err on the side of caution—after all, you can always add more later to taste. If you’re not using MMP but want to add some instant umami, toss in a few dried mushrooms into the stew! Do I need to sear the short ribs? Nope! I’ve tried it both ways (seared and non-seared), and the non-seared way tastes just as good. Also, it requires less hands-on time! Don’t believe me? Read this article in the New York Times that explains why no browning is necessary. Why does the sauce seem oily or greasy? Short ribs are naturally a fattier cut of beef—that’s why it’s so tasty and tender when you cook it low and slow or quickly under high pressure. But that means the resulting sauce is fattier, too. My kids don’t love fatty-tasting sauces, so I normally make this stew ahead of time and chill it in the fridge overnight. When I’m ready to reheat it, I just remove and discard the hardened fat cap, which naturally de-fats the sauce! 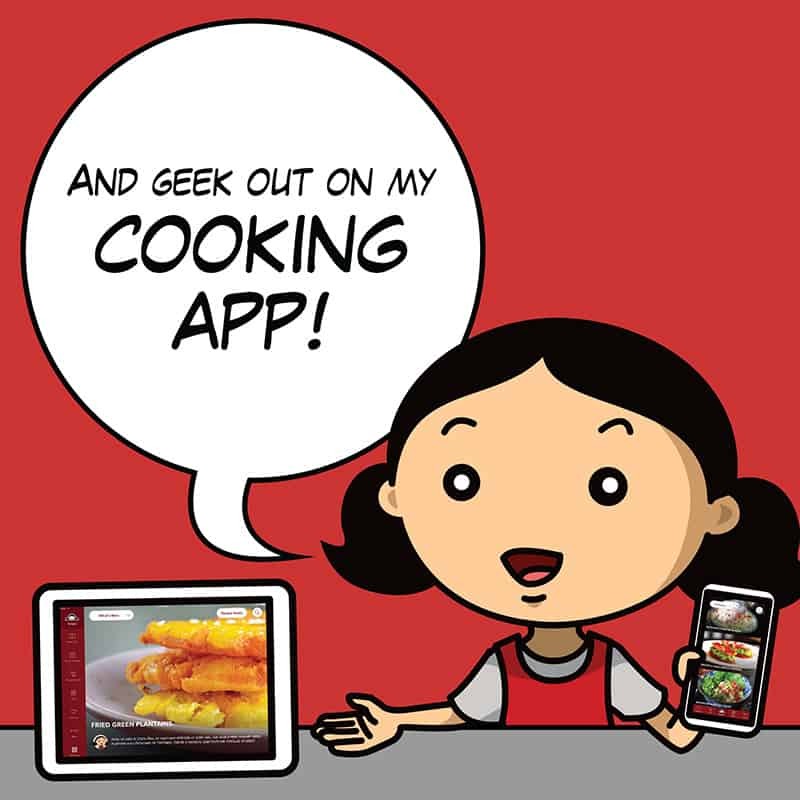 Can you make this dish ahead of time? For sure! Because this dish takes about 90 minutes to cook from start to finish, I highly recommend making this dish ahead and reheating it to serve later. On the other hand, this dish requires so little prep time that you can just throw the ingredients into an Instant Pot any time you have about 10 minutes to spare. Sometimes, I do it in the morning before I leave for the day. Other times, I program the stew before I go to bed. That way, when I get home or wake up, the stew is depressurized and ready to eat or store! How do you store and reheat these short ribs? You can store the short ribs in the fridge for up to 4 days or in the freezer for up to 4 months. The easiest way to reheat any stew is in an Instant Pot. After I remove the hardened fat cap, I plop everything into the Instant Pot and cook it for 3 minutes under high pressure. You can even reheat the stew from frozen using the same instructions—it’ll just take longer to reach high pressure before the 3 minute countdown starts. What are some good side dishes to serve with this? 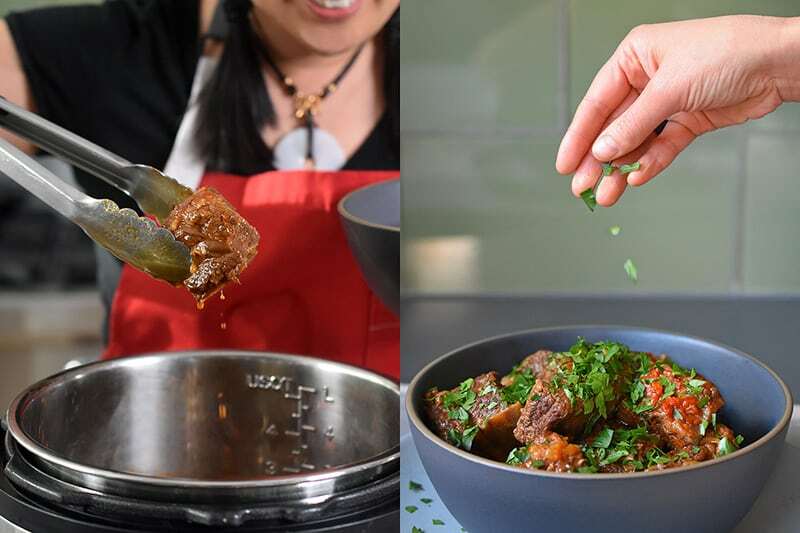 I love serving Instant Pot Magic Short Ribs over Simple Cauliflower Rice or Garlic Cauliflower Mashed “Potatoes.” If you want to eat this with spiralized zucchini noodles, just toss the raw zoodles into the hot stewing liquid to get them perfectly al dente. What about Crock-Pot or oven instructions? Sauté the shallots and garlic in a 6-quart Dutch oven. Increase the amount of marinara sauce to 2 cups and add the rest of the ingredients. Transfer the covered pot to a 300°F oven and cook for 3 to 4 hours or until tender. Time to make some comforting short ribs! 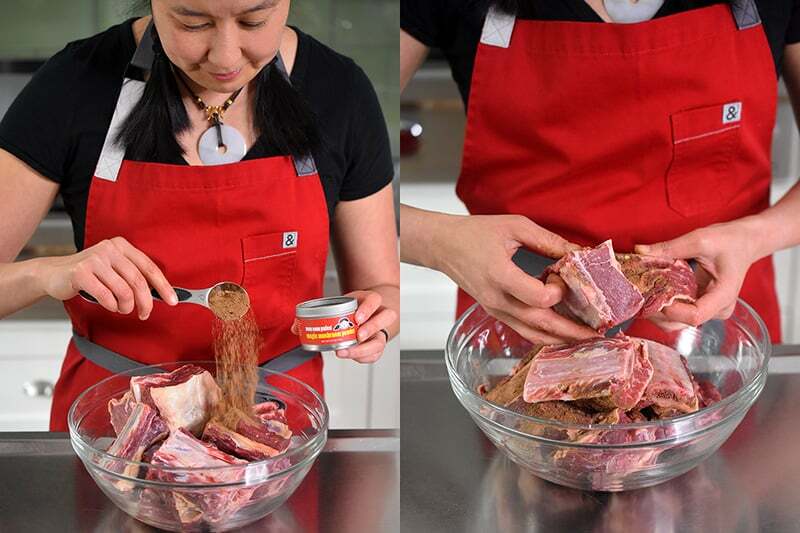 Pat the beef short ribs dry with paper towels and toss them in a large bowl with the Magic Mushroom Powder. Mix well. Turn on the “Sauté” function on the Instant Pot. When the metal insert is hot, pour in the extra virgin olive oil or cooking fat of choice. Toss in the sliced shallots and cook until slightly softened. Dump in the smashed garlic cloves and cook until fragrant. …and pour in the marinara sauce. Stir well to distribute the marinara sauce evenly. Cancel the “Sauté” function and lock the lid on the Instant Pot. Program it to cook for 45 minutes under high pressure. The cooked short ribs should be fall-off-the-bone tender. If they’re still a little tough, cook for about 5 more minutes under high pressure. Taste the short ribs and adjust the seasoning with more Magic Mushroom Powder or salt if necessary. 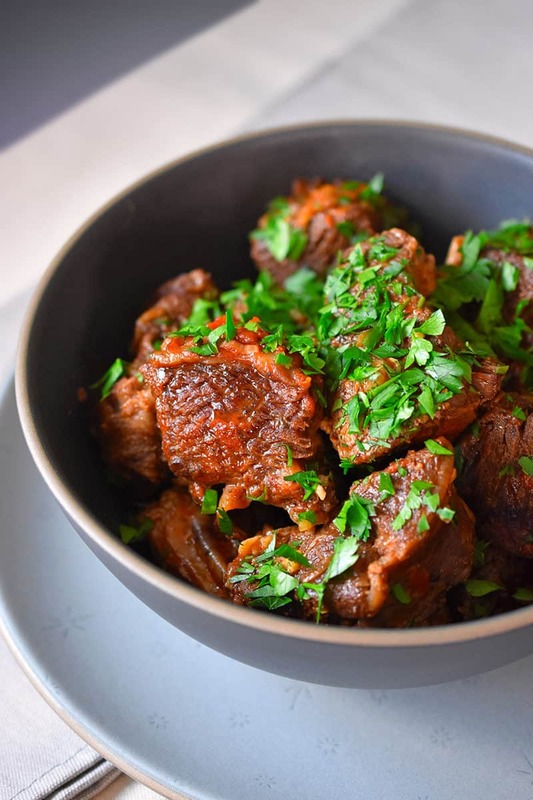 Transfer the short ribs and sauce to a serving platter and top with minced Italian parsley if desired. 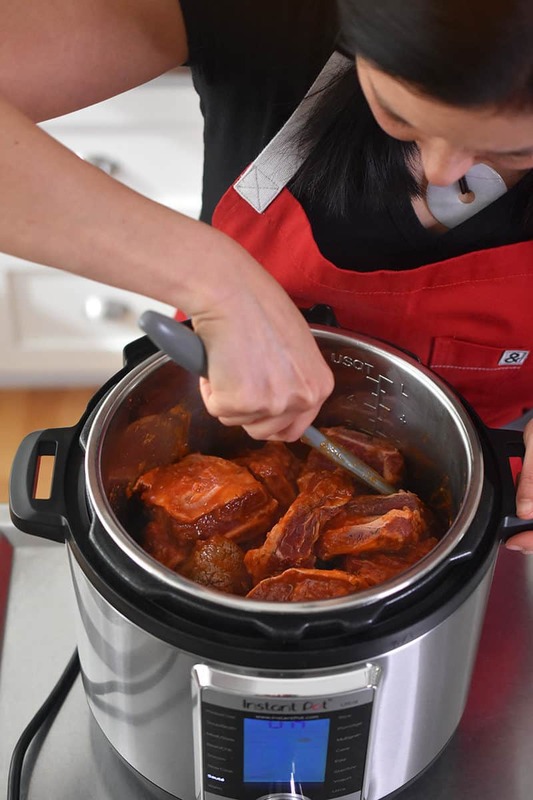 Instant Pot Magic Short Ribs is the easiest way to make fork-tender, Italian-inspired, Whole30-friendly beef short ribs that your whole family will enjoy! Turn on the Sauté function on the Instant Pot. When the metal insert is hot, pour in the extra virgin olive oil or cooking fat of choice. 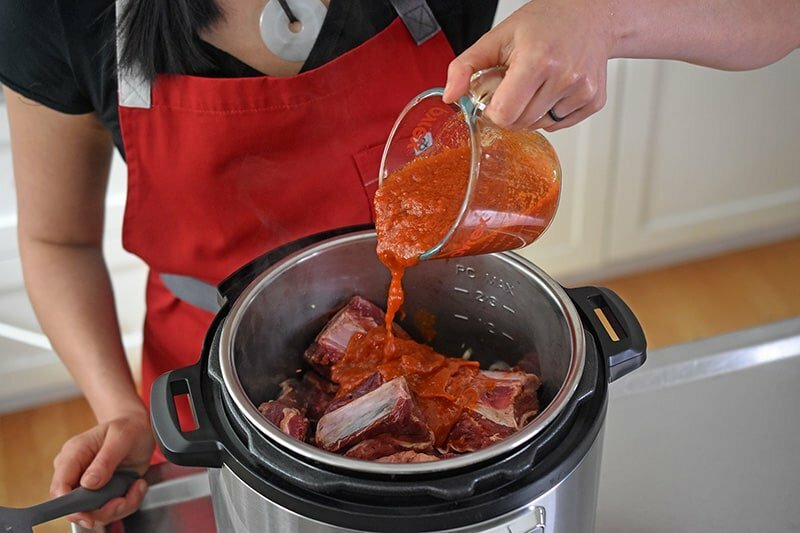 Carefully plop in the seasoned beef short ribs and pour in the marinara sauce. Stir well to distribute the marinara sauce evenly. 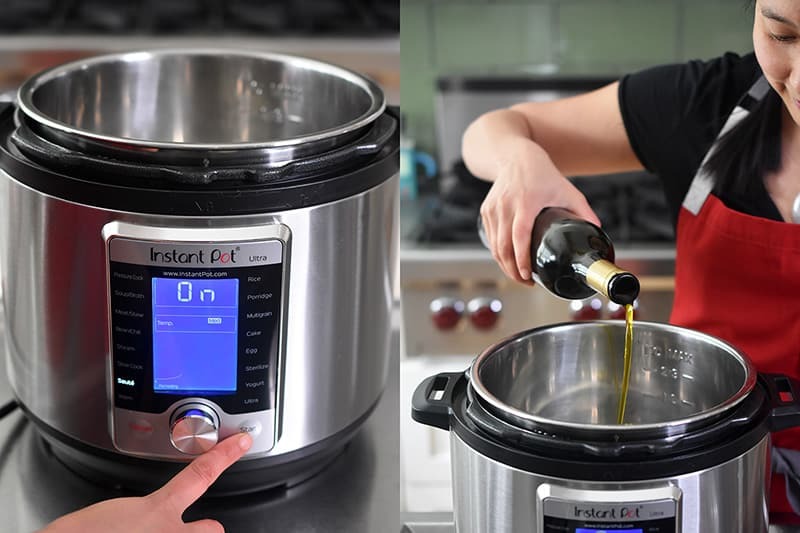 Cancel the Sauté function and lock the lid on the Instant Pot. Program it to cook for 45 minutes under high pressure. The ribs should be fall-off-the-bone tender. If they’re still a little tough, cook for about 5 more minutes under high pressure. Taste the short ribs and adjust the seasoning with more Magic Mushroom Powder or salt if necessary. Transfer the short ribs and sauce to a serving platter and top with minced Italian parsley if desired. You can store the short ribs in the fridge for up to 4 days or in the freezer for up to 4 months. 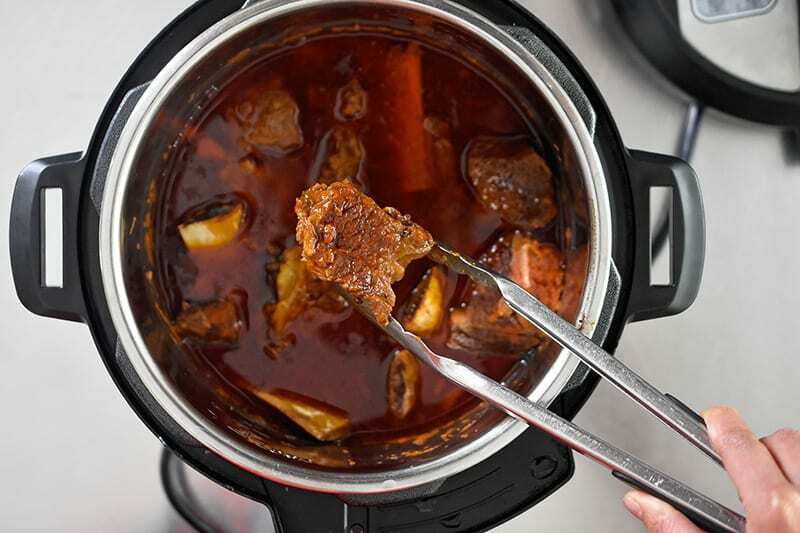 The easiest way to reheat any stew is in an Instant Pot. After I remove the hardened fat cap, I dump everything into the Instant Pot and cook it for 3 minutes under high pressure. 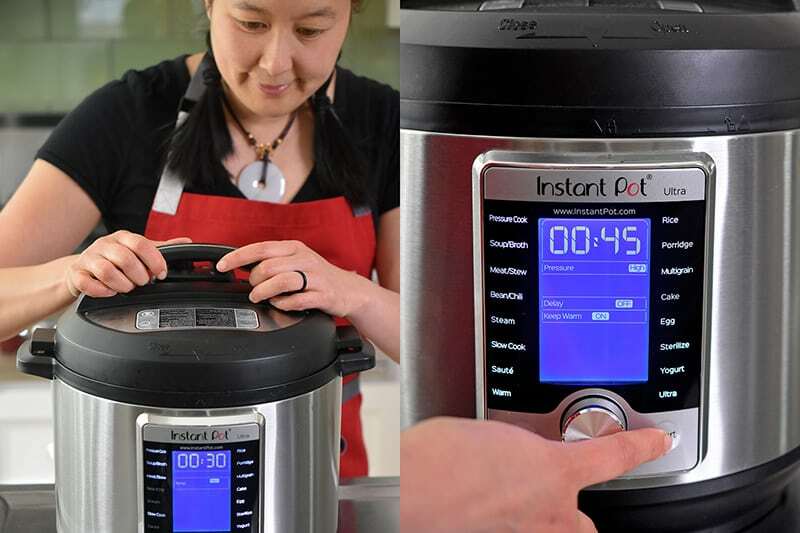 You can even reheat the stew from frozen using the same instructions—it will just take longer to reach high pressure before the 3 minute countdown starts.